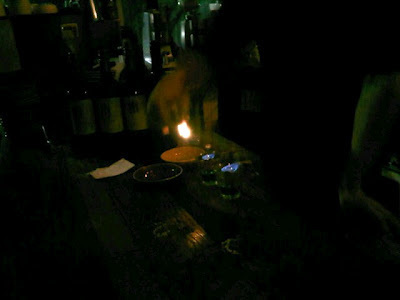 Trying Absinthe is a Life List challenge I thought would be so very easy to tick off. But for some reason I haven't been able to try it. I could just go and buy a bottle and try it at home. However as it is a 'Life List' item, I want to go to the Absinthe Salon in Surry Hills and try and savour Absinthe the correct way... like back in the days of Toulouse Lautrec and Van Gogh. Shame the one I will be trying has the 'alleged' hallucinogenic properties removed. According to the Absinthe Salon, it is an experience that will be sure to 'captivate and enthral' as well as a ritual to how it should be prepared and drunk. However this new plan didn't go exactly to plan. On Saturday night, I was out with my favourite girls in Wollongong and popped into a new little bar called Yours and Owls. I saw that there was Absinthe on the menu and decided I had to try it and tick it off the list then and there. I liked it very much. It had a nice heat to it, with a slight aniseed after taste. We even had it the authentic way, with lit sugar cube. However I still have plans to take husband to the Absinthe Salon and try Absinthe together and relive the 'proper' Absinthe experience. Looking forward to having it again.